Arthrogryposis (AMC) is a rare group of disorders that describes multiple joint contractures or limitations of the joints in the body. First, AMC is rare though we can see it from all ethnicities. In AMC, the joints of the body have limitations in motion and can affect multiple parts of the body and are not limited to one side of the body. This is present from birth and it is considered “stable” meaning it doesn’t typically get worse during the lifetime of a patient. Therapies can help but there are no current cures. Three types of arthrogryposis exist. Classic arthrogryposis is not hereditary; it affects multiple joints in the body. 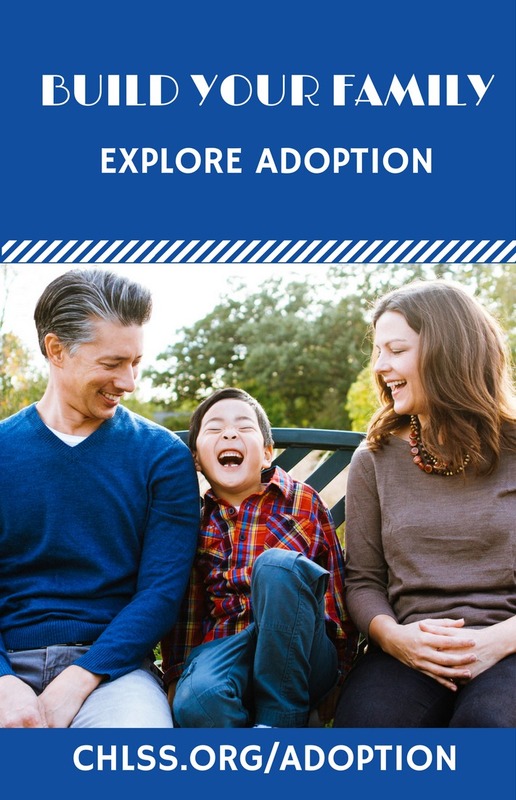 Distal arthrogryposis is hereditary; nine different subtypes have been identified and have slightly different features and degrees of severity. Distal arthrogryposis usually only affects the feet and hands. 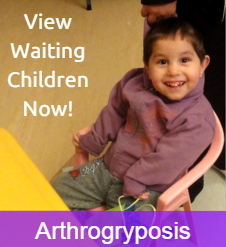 Syndromic arthrogryposis is the last type. Some of the distinguishing points are that the newborn’s hands are clenched tightly in a fist with overlapping fingers. The feet are often in an abnormal position, an example is clubfoot (equinovarus) or flatfoot (calcaneovalgus) and the hips, knees and shoulders can be dislocated or in an abnormal position as well. 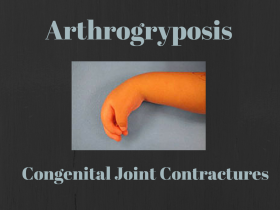 There are multiple potential causes for the joint limitations in AMC including nerve problems or abnormalities, inherent muscle/joint problems or syndromes, or if the fetus is too crowded while in utero (before birth). Arthrogryposis Multiplex Congenita: A lifelong syndrome that causes limitation in movement due to “locked” joints. May improve with therapies and/or surgeries but no current cure. Complicated potential causes and many cannot be worked up prior to child coming to the USA- will need workup once they come home. 1. Standars N. In: Jones KL (Ed). Smith's recognizable patterns of human malformation. . 2006. 2. Gibson D, Urs N. Arthrogryposis multiplex congenita. Journal of Bone and Joint Surgery-British Volume. 1970;52(3):483. 3. Hall JG. Arthrogryposis multiplex congenita: etiology, genetics, classification, diagnostic approach, and general aspects. Journal of Pediatric Orthopaedics B. 1997;6(3):159.